(Los Angeles: TIA, 2002), 175 pp. 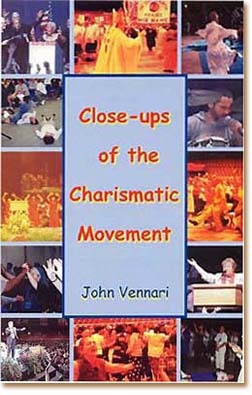 I was impressed after reading Close-ups of the Charismatic Movement by John Vennari. In many senses it was a shock for me, since I lacked a full idea about such a movement. I had never had the time before to study the so-called Pentecostal or Charismatic Movement. Only once did I have an opportunity to view it superficially. This was in winter 1991-1992 during a two-month rest in Paris after I had finished writing my collection on the Council. I took advantage of that time to visit the Charismatics center there, which was located in downtown Paris at the Church of St. Gervais one block from the Hotel de Ville [Civic Center]. Their center’s focus was liturgical, trying to present the New Mass and the reforms of Vatican II in a “conservative” light. They had the strong support of Cardinal Lustiger, Archbishop of Paris, who at that time played the role of seducing the French Catholic right to his corner. Since I have never swallowed Lustiger’s “conservatism,” I was immune to its contagion. The group of St. Gervais was called The Community of Jerusalem. It was the main bloc of countless Pentecostal units spread out all over France, which were told to present themselves as fragmented and not as an ensemble. I visited St. Gervais, spoke with a monk and the lady who ran the bookstore, and bought a dozen books, booklets, and several tapes to study later. I listened to the tapes, but have never had time to read the books. In Paris this group had a monastery (men and women living under the same roof), and it also had a farm somewhere else in France. After learning that the main service for The Community of Jerusalem was on Thursday evening at 5:30 p.m., I decided to attend. The interior of the Church of St. Gervais is gothic, cast in shadows, lofty and vast. The white marble altar – in the baroque French style, the enormous golden chandeliers, and the exquisite ironwork of the sacristy grills still maintained the rich and prestigious tone of the pre-Vatican II era. The presbytery choir, however, was void of benches and without a rail to separate it from the faithful. In the central nave, no pews, benches or chairs, just a massive, well-worn ochre-colored carpet that covered the floor from the altar to the entrance door, and from the left nave to the right. Among the some 200 persons there on Thursday evening, I was present, sitting uncomfortably on that carpet. At 5:30 p.m., 30 monks and 30 nuns processed from the sacristy to the presbytery, all walking slowly without candles or light in the shadowed ambience of the church on that rainy winter evening. Both the men and women wore white mantles draping to the floor. Under the mantles, the men had black habits, and the women faded blue ones. Covering the head of each woman was a loose cloth in the Buddhist style of Teresa of Calcutta, replacing the traditional religious veil. All were wearing sandals. They filed into rows on both sides of the choir section of the presbytery and, facing each other, seated themselves on their heels. Until 6 o’clock they remained there immobile and silent. Then, a few lights broke the darkness, and an insecure male voice began to intone a Gregorian psalmody. The male and female choirs alternated, with most of the solos sung by the women in much a more affirmative tone than that of the fragile monks. At times a nun – a different one each time – left the choir to go to the altar and light a candle or read some text near the altar place as if she were the celebrant. Two monks ventured forth to incense both the altar and the faithful, moving up and down the center aisle with a cheap thurible that spread thick, heavy clouds of smoke that gave me a headache. The chanting droned on and on. 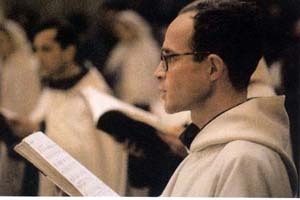 A monk went to the altar, read the Gospel, and returned to his place, leaving the altar vacant, as always. Finally, another monk approached the altar, assumed the place of a celebrant and started the Offertory. Only then did it become clear that he was a priest and that we had already progressed far in the celebration of the Mass. Until then it had been “celebrated” by the ensemble of monks, nuns, and the faithful. 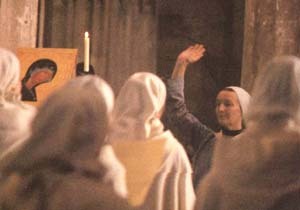 Returning to the presbytery, the monks formed a back row behind the altar while the nuns surrounded it in a semi-circle. The celebrant pronounced the ritual words of the Consecration and distributed the bread and wine to the monks and nuns, who all took communion at the same time with the celebrant. After that, pairs of monks and nuns gathered up trays and goblets to bring the communion under two species to the faithful. There was no receiving line; they walked around the church serving everyone. All – or almost all excepting me – received the communion. 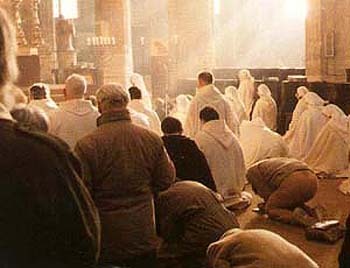 During the thanksgiving many knelt and put their forehead on the floor, in that same Muslim pyramidal position. •	First, the promiscuous situation of women and men living together in the same religious house is in itself a denial of original sin in its refusal to acknowledge that this situation characterizes an occasion of sin. •	Third, the primacy of the women over the men helped to create this ambience of “sweet love,” falsely presented as an expression of Catholic charity. •	Fifth, the virtual abolition of almost any distinction between the priest and the religious men and women, as well as the latter’s blending with the laypeople, contributed to the saccharine experience of equality. As far as I could analyze, these were the components of the “sweetness” that I felt in the general ambience of that ceremony. Was there any mystical phenomenon? When I arrived, I noticed a young woman in her 20s seated on the floor, shaking around in lascivious movements without saying anything that could be heard five yards from her, where I was. During the ceremony I also noted a man sitting on the floor close to me, who, after alternating between “sublime” smiles and trembling fits of recollection, finally fell to the ground in some sort of epilepsy attack that didn’t last long. When the ensemble of those present raised up their arms asking for “the Spirit” to come, one could perceive a general air of mystical expectation that this would in fact take place. It did not. 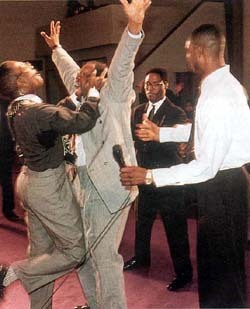 This was the Pentecostal movement that I experienced on that occasion. It was considered “conservative” and highly praised by Cardinal Lustiger. It was attracting many young people of the middle class, and was increasing the number of entrants to seminaries, monasteries and convents. Above, a Protestant being "slain in the spirit." 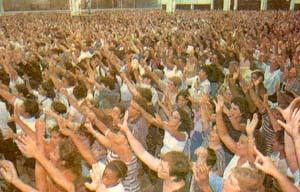 For a person like me, relatively uninformed about Catholic Pentecostalism, John Vennari’s book Close-ups of the Charismatic Movement was invaluable. •	It is essentially anarchical: Since each one imagines that he receives “the Spirit,” there is no need of authority, hierarchy, rules and government, the very definition of anarchy – anarchia, from the Greek: an (without); archia (government). •	It is essentially anti-sacral: Since the manifestation of one’s spontaneity is the only established and accepted rule, there is no place for the ensemble of ceremonies due to God or the appropriate sacral ambience of worship. Close-ups has another advantage beyond the scholarly information it presents. It provides the reader with a very lively description of the Charismatic meetings the author witnessed. It is so vivacious that you feel as if you were almost there participating at them. There is a point to which I paid close attention throughout my three readings of Close-ups. It is the presence of “the Spirit.” What I saw in Paris was almost nothing compared to what was witnessed by John Vennari on many, many occasions here in the United States. Perhaps this is the most important point of his book. One can read about all kind of presence of such “Spirit”: people shaking, trembling, rolling on the floor, screaming, shrieking, speaking in tongues, barking like dogs, oinking like pigs, laughing hysterically etc. The author warns us that such “Spirit” can, in fact, not be real, even though there is an allusion to the Devil’s presence when he indirectly touches on the subject (pp. 25-8). Most of the time, however, it is a fake thing that is either an outright lie or a shameless charlatanism. There are many people who pretend to receive “the Spirit” to go along with the charismatic fashion: they are liars. Vennari quotes an interesting test made by Jerry Matatics during a session of “speaking in tongues.” In such sessions each one who “receives the Spirit” starts to pronounce incomprehensible sounds that are interpreted by a monitor directing the meeting, supposedly an expert in the way “the Spirit” manifests itself. 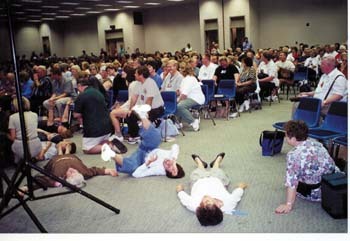 Matatics simulated having received such “Spirit” and gave the impression that he started to speak in tongues. Actually, he was just repeating one or two sentences of a psalm in Hebrew; he understood the meaning of the words perfectly. The interpreter, who didn’t know a single word of Hebrew, gave a complete different meaning to the sentences. An irrefutable proof of a shameless charlatanism. But even though these lies and shams are evident, and even if they constitute the majority of the cases, here let me leave then aside and face the reality of the actual presence of some “Spirit” at these sessions. In many Protestant sects like the Quakers, Shakers, Tremblers and Pentecostals, they claim to receive “the Spirit,” and one manifestation of such a “privilege” is to start to shake and tremble like epileptics. These people also “prophesize” while they are in these trances. It is said that from these experiences comes some of the orientations that the sects follow. As far as I know, the Catholic Church always, until Vatican II, considered this “Spirit” as being the Devil. She knew what she was talking about. She is right, as always, since the symptoms of the presence of the “Spirit” in such sects are almost the same as those produced in the voodoo sects, which worship the Devil by his very name. People who are in the possession of the Devil in voodoo sessions also shake, tremble, roll on the floor, imitate the sounds of animals, salivate, prophesize, and speak in tongues. Therefore, the similitude of effects strongly induces one to think that the same cause is in the root of same effects. The difference between the Protestant sects and the voodoo sects is only the radicalism of the latter, which use animals’ blood, black and white magic, and various other primitive methods to worship the Devil. Essentially it is the very same presence. Consequently, I conclude that the “Spirit” that manifests itself in the mentioned Protestant sessions is no other than the Devil. 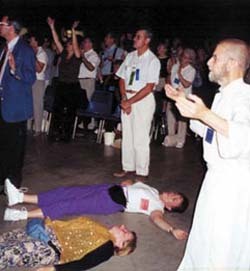 I don’t know by what sortilege the Catholic Charismatic movement considers that the Devil’s presence which exists in those Protestant sects, and particularly in Protestant Pentecostalism, would be transformed into the presence of the Holy Ghost when this spirit shows up at their meetings. The same Protestant preachers are speaking both at one and the other; the same Protestant principles are admitted at one and the other; the same Protestant methods are applied at one and the other. So, why isn’t the “Spirit” that appears at one the same that appears at the other? Indeed it is the same spirit. I don’t know any serious argument that denies this fact. And until I become aware of such a negation, I am convinced that the same Devil who manifests himself at the Protestant sessions also manifests himself at the Catholic Charismatic sessions. Another interesting thing that results from the reading of Close-ups is to see the affinities between today’s Charismatics and yesterday’s Modernists. •	It is a mystical experience that is not extraordinary, but that occurs almost automatically when determinate emotional conditions are present. That is, it does not coincide with the extraordinary mystical phenomena that occur in the lives of many saints, but it is implicitly presented as a replacement for the normal life of piety. •	It is an action made by God directly on the soul of an individual, be he either Catholic or Protestant. That is, it ignores the oneness of the Holy Church as the true Church chosen by God. •	It is a subjective revelation that in practice puts aside objective divine Revelation, which was officially closed with the last book of Scriptures, the Apocalypse. •	It is a phenomenon in which the sensibility is dominant. I.e., it is not subordinated to the judgment of reason, but relegates the data of the intelligence and the decisions of the will to a secondary plane. Consequently it subverts the normal order that must exist in the soul. That is, it does not coincide with the normal spiritual action of grace that makes the soul more perfect. I don’t want to analyze all these aspects here. This could be done at another time. I will just show how the religious sentiment that is at the base of the Charismatic movement is precisely the same that was the fundament of Modernism. “In the religious sentiment one must recognize a kind of intuition of the heart which puts man in immediate contact with the very reality of God, and infuses such a persuasion of God's existence and His action both within and without man as to excel greatly any scientific conviction” (1). “The religious sentiment, which through the agency of vital immanence emerges from the lurking places of the sub-consciousness, is the germ of all religion, and the explanation of everything that has been or ever will be in any religion” (2). “For Modernism finds in this sentiment not faith only; but with and in faith, as they understand it, revelation, they say, abides. For what more can one require for revelation? Is not that religious sentiment which is perceptible in the consciousness revelation, or at least the beginning of revelation? Nay, is not God Himself, as He manifests Himself to the soul, indistinctly it is true, in this same religious sense, revelation? And they add: Since God is both the object and the cause of faith, this revelation is at the same time of God and from God; that is, God is both the revealer and the revealed” (3). This role of the mystical experience as the base of religion summarizes the Modernist doctrine – qualified by St. Pius X as “the synthesis of all the heresies” (4). 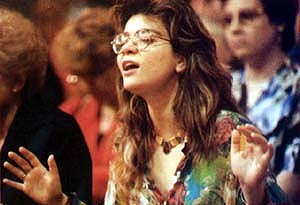 How does it apply to the Charismatic movement? 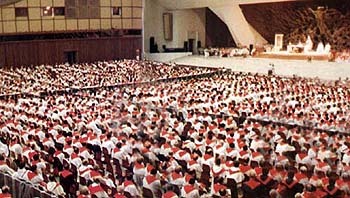 Charismatic priests from many different movements met at the Vatican October 1990. Inside the Vatican, March 1996. Reading Close-ups, one realizes that the role of the mystical experience summarizes the whole Charismatic movement. If both have the same base, both have the same essential error. Charismatics and Modernists are brothers in their common action to destroy true Catholic piety. Are there differences? Certainly they exist. The major difference is that Modernism presented itself as a serious movement, and in Catholic Pentecostalism seriousness is a note much less perceptible. There are also differences among the various branches of the Charismatics. I described above the French movement as more “conservative,” while the American one described by John Vennari is more turned toward a kind of Mardi-Gras’ euphoria. But, putting aside the accidental differences, all the Charismatics are the same, and deep down all repeat the same error of Modernism. 1. St. Pius X, Encyclical Pascendi Dominici gregis, Official English Translation, Vatican Internet Site, n. 14.